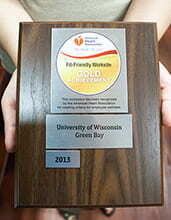 Members of the UW-Green Bay Wellness Committee on Monday (June 3) accepted a “Fit-Friendly Worksite” gold-level accolade from the American Heart Association, in recognition of the University’s efforts to promote employee wellness. 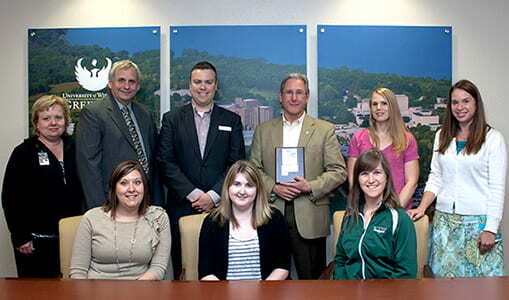 The AHA’s Mike Link met Monday with Chancellor Tom Harden and committee members in the Chancellor’s Office for the presentation of an award plaque. UW-Green Bay learned of the designation in March, and will receive recognition on the AHA’s “Start Walking Now” website, as well as at local Heart Association events and in communications materials for the “Fit-Friendly Worksite” program. 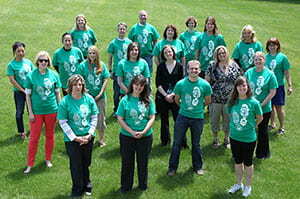 The UW-Green Bay Wellness Committee has coordinated numerous efforts in support of employee health. Also on Monday, members of the University’s Bellin Run Corporate Challenge team picked up their event packets and t-shirts from members of the Wellness Committee, and participated in a group photo. Last week (Thursday, May 30), all employees were invited to participate in the Wellness Committee’s “Fuel Your Inner Phoenix” health and wellness fair, a daylong event featuring speakers, fitness classes and other sessions designed to promote healthy living. The committee also has sponsored walks, drawings, lunchtime learning events and other events to encourage employees to eat right, get fit and stay active. And while the individual advantages of employee wellness are clear, having a healthy workforce also provides collective benefits, according to the AHA. Studies suggest that implementing a worksite physical activity program helps increase productivity, reduce absenteeism, lower turnover and reduce healthcare costs. The UW-Green Bay Wellness Committee’s next event is a Lunch and Learn Healthy Choices Potluck, which will be held from noon-1 p.m. Thursday, June 13 in Phoenix Room C of the University Union. Attendees are invited to showcase personal recipes and look for new, healthy inspirations for their own menus. To sign up to bring a dish and/or to provide a copy of your recipe for the event, email Chrisanna Colletta. More information about the UW-Green Bay Wellness Committee is available online. This entry was posted in News and tagged award, faculty/staff, wellness on June 4, 2013 by Kelly Moore.